Get in touch with the latest dual digitizer technology with the optional capacitive multi-touch screen and all new Intel® Core™ i5/i7 vPro™ Processor . With its support of on-screen gestures, the dual digitizer takes user interaction to a new level, delivering a more efficient and convenient computing experience. 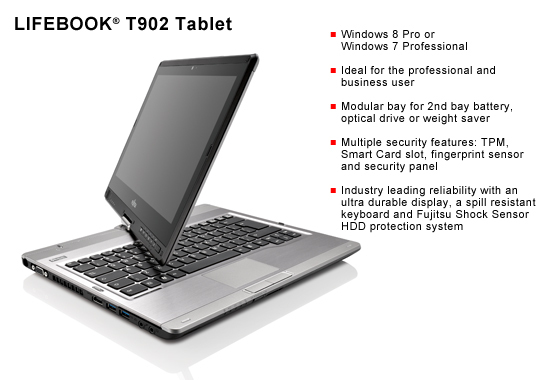 The LifeBook T902 Tablet PC offers the ultimate freedom of choice - optional dual digitizer with pen input and multi-touch interaction, modular bay, and optional bright display providing 160 degree vertical and horizontal viewing angles. Intel® HD 4000 integrated graphics controller. Uses Unified Memory Architecture (UMA) built onto motherboard which shares part of main memory for video memory. The amount of shared video memory is determined by the amount of system memory. With weight saver: Approximately 4.69 lbs. With optical drive: Approximately 5.05 lbs. With bay battery: Approximately 5.31 lbs.